There's one simple rule of thumb that applies to spots on the human body, "see spot, check spot and save a life". Now there's an iPhone app for doing just that. Love My Skin ($.99) was developed to fill in for those paper body mole maps dermatologists hand out to help patients track their moles. 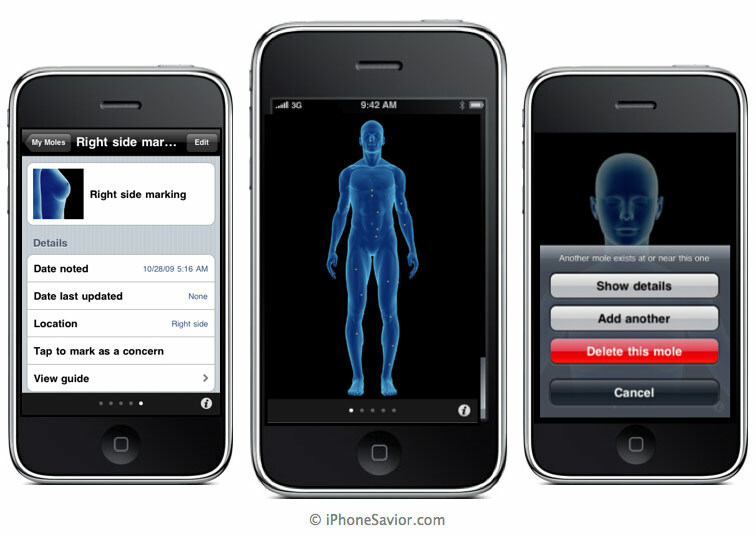 The idea behind this blue man app is empowering users to do their own skin cancer self-examination by providing several body views, both male and female that allow users to place markers with their iPhone where moles and other spots exist. Checking your skin for what could develop into a cancerous melanoma means taking note of all the spots on your body, from moles to freckles to age spots. One of the keys to treating melanoma is recognizing symptoms early. Love My Skin helps you map and track the markings on your body so they can be communicated accurately to a Dermatologist. The app contains a helpful ABCD Guide to identifying the shapes and sizes of a benign and malignant melanoma. Developer Steven Romej, hopes his app will help promote awareness and facilitate the early detection of skin cancer. It's not meant to be a replacement for a professional's opinion. Love My Skin is not the first health conscious app produced by Romej, he's also developed Eat Right Daily Food Log ($1.99) promoting healthy eating habits based on the USDA food pyramid. Although Love My Skin is aimed at cancer prevention, it carries a 17+ rating because of the obvious blue nudes that allow for zooming in. While I couldn't get past thinking about the full frontal male dudity I encountered when starring down a glowing blue Dr. Manhattan in "The Watchmen" film, this app omits one such dangly part. Making the voluntary mapping of moles much less harrowing. The biggest difficulty will come in when trying to explain the concept of a "mangina" to a four year old as it appears in this useful iPhone app. At least 1 in 65 people in the United States, will be diagnosed with melanoma at some point in their life. The risks associated with developing melanoma increases with age. If you have any doubt about a mole, seek out a dermatologist at the American Academy of Dermatologists (www.aad.org). I never take proper care of my skin when I was a kid on central america, and now I got the effects, always have to put myself cream for the sun, always always.